Chilean Newspaper Lists Shenmue, Okami as Part of "Worst Games of All-Time"
Chilean "videogame experts" Marco Bocaz and TomÃ¡s CofrÃ© includes Shenmue and Okami in Chilean newspaper Las Ultimas Noticias' "Top 10 worst games of all-time" list. While gamers around the world have different tastes, most of the time, a good game is considered good regardless of which part of the world the player is in. 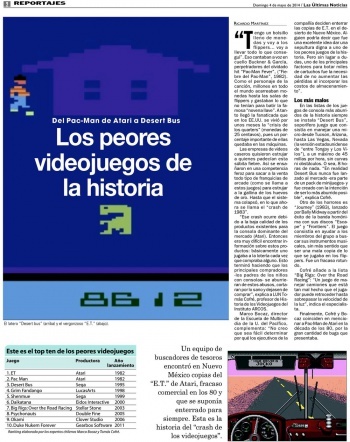 Apparently, that might not be the case in Chile -- at least according to the two "video game experts" entrusted by Chilean newspaper Las Ultimas Noticias (LUN) to run its "Top 10 Worst Games of All-Time" list. Just this weekend, the newspaper ran a piece about Microsoft's search for the E.T. cartridges. Given that the game was one of the catalysts for the big video game crash of the 80s, well, it's safe to say that the game wasn't a paragon of good video game design. Coinciding with this, the so-called experts who teach video games in Chile -- Marco Bocaz and TomÃ¡s CofrÃ© -- have compiled the ten worst video games in history and for some reason, have included both Shenmue and Okami in the list. As if including Shenmue and Okami weren't bad enough, the list also includes Pac Man and Double Fine's Psychonauts, too. Granted, taste is subjective, but it's hard to believe that SEGA's highly revered action game is worse than say, Aliens: Colonial Marines. For reference, over on Metacritic, Shenmue is sitting at an impressive 88 average, while it's user rating is at an astounding 9.7 average. As for Capcom's Okami, the PS2 version has nested itself at a very impressive 93 average, with users rating the Clover Studios-developed action-adventure game at 9.3. Before you label Chilean gamers as having bad taste, keep in mind that not every Chilean gamer is on the same boat. Over on NeoGAF where the finding was posted by maltrain, he cites that "every Chilean gamer" disagrees with this crappy ranking. You can check out TomÃ¡s CofrÃ©'s explanation over on his Facebook page if you wish. Do you agree with the list that these ten games are the worst of all time? If not, what would your top ten be? And please don't tell me that includes Shenmue or Okami, too, alright?